Belarus officials have used bulldozers to demolish 70 crosses marking the site of mass executions during Joseph Stalin's communist dictatorship. The crosses formed an unofficial memorial in the woods at Kuropaty, near the Belarusian capital Minsk. About 30,000 victims of the Stalinist terror are buried there, officials say. But independent historians say as many as 200,000 were shot there by Soviet secret police in the 1930s and 40s. Now police have cordoned off the site. Belarusian media report that 15 civil society activists were detained there by police. Not all the crosses at the site were removed. The bulldozing has been widely condemned in Belarus. An MP, Anna Kanopatskaya, witnessed it and wrote on Facebook (in Russian): "It's as if Satan came to Kuropaty. No Christian in the world raises a hand against a holy cross! All, ALL those who committed this blasphemy today will bring misfortune on themselves." Last month Belarus President Alexander Lukashenko criticised those who had placed crosses at Kuropaty. "We're going to restore order at Kuropaty, so that there are no demonstrations with crosses around the perimeter," he told a public meeting. Mr Lukashenko has cracked down repeatedly on opponents, drawing criticism from Western politicians and human rights activists. Activists including the opposition United Civil Party (UCPB) published photos of the bulldozing, on Twitter and elsewhere. Mr Lukashenko has run Belarus since 1994, maintaining Soviet-era symbols and security structures. Some Western officials call him "Europe's last dictator". A Belarus forestry manager, quoted by the state news agency Belta, said the bulldozing was part of "renovation work" on the site. "At the same time we are removing the illegally erected crosses. They are disappearing in the place where fencing is going up," said the manager, Alexander Mironovich. No government memorial has been placed at Kuropaty, even though the exhumation of Stalin-era victims began there soon after it was revealed in 1988. 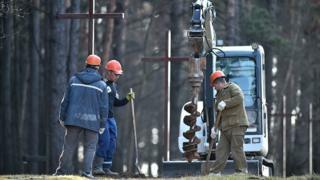 In Brest, south-western Belarus, the remains of Jews murdered by the Nazis in World War Two are being dug up from a mass grave recently unearthed during building work.